There are hundreds of hair stylists in Austin, I really appreciate that you are trusting me with your hair! 💜 I strive to give the most premium services to my clients! To me, that means giving you a ton of education and information for your appointment! I am located at Mint Salon, 4023 Guadalupe St, Austin TX, 78751 (Click the address for directions). There is a dedicated parking lot, plus parking on Guadalupe in front of the salon. If the lot is full there is also street parking on 40th and 41st street. We will start your visit with a consultation to discuss not only your Hair Plan for this visit but your long-term Hair Plan as well. I want you to have amazing hair all of the time! In order to do that, I will make product suggestions and let you know when to come back in for your maintenance. All New Client Services take a little longer and cost more on your first visit because I include more time so that everything runs smoothly, all following appointments will be at my regular rates. 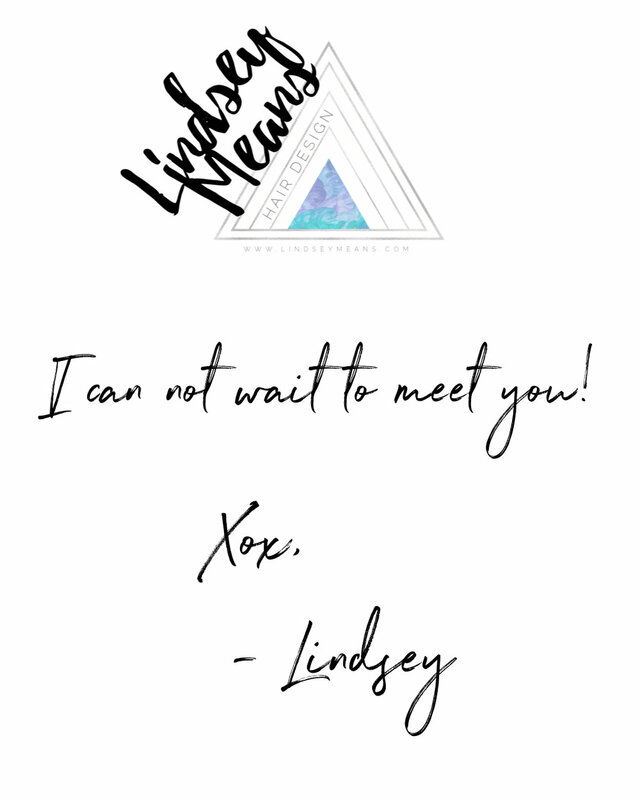 The best way to reach me is by email at lindsey@lindseymeans.com. You can always check the status of your appointment or reschedule 24 hours a day by clicking here. You are taking time out of your day to invest in your hair, I want you to feel like a queen while you are with me and when you leave! 👑 All Services include a scalp massage, blow out and style + a mini photoshoot at the end! 📸 All Color and Lightening Services include a Porosity Spray, which ensures even color absorption, and a Leave-In Treatment that will help seal the cuticle, fight frizz, and add nourishment and strength. Prices subject to change, please click here for the current prices and more information on services. My name is Lindsey Means, and I am so excited to do your hair! ✨ I am so thankful that I am fortunate enough to do something that I absolutely love for a living! My passion lies in being the Creative Director for my clients by giving them beautiful customized looks while also helping them maintain their look at home. I love making my clients fall in love with their hair again, it really makes my day! I have iPhone and Android chargers with additional plugs in case you need to charge your computer or tablet. Complimentary WiF and magazines are also available. I require 24-hour notice to cancel or reschedule your appointment. Rescheduling with less than 24 hours before your appointment will result in your card being charged 50% of the services that were booked. Failure to show up for your appointment will result in your card being charged 100% of the services booked. Due to my tightly booked schedule and my desire to give each of my clients the best service possible I will not be able to accept a client who is over 10 minutes late. You will need to reschedule and will be charged 50% of the service booked. Most of the time it should be achievable in one session but in some cases, it does take multiple sessions to get there. I like to let my New Clients know that I will do everything possible to get you to the inspo pics! Either way, you will leave with gorgeous color!!! Beautiful hair is created in the salon, it is maintained by you at home and by getting on a regular Hair Plan. There are two parts to investing in your hair, getting it done at the salon and taking products home. I can only guarantee my color services if the suggested products are purchased. Let me explain a little about Drugstore Products vs Salon Grade Products. Drugstore shampoos do contain high-grade ingredients found in salon products but they only contain small amounts of them. The majority of what you are using is water, with minimal amounts of what your hair needs. They will typically make the outside of your hair feel soft and smooth, but nothing penetrates into the hair meaning your hair is parched on the inside. Salon grade shampoos tend to be on the pricier side because they are highly concentrated with high-grade ingredients. The majority of what you are using is the high quality ingredients and very little water. They often consist of vitamins, essential oils, and minerals that are truly nourishing from within. Since premium shampoos are more concentrated, you don’t need to use as much to see results. The products that we have at the salon range from $25-45, prices below subject to change. I have to warn you about buying Salon Grade products at the grocery store, Amazon, eBay, etc. Unless you get them from a salon, the product could be what they call diverted. Diverted product could be diluted with fillers, they may be expired, and they may contain bacteria. I’m pretty sure product from Ulta isn’t diverted because they are considered a salon. A lot of time the diverted product is actually more than at a salon! Now that you have ALL of the education let me tell you about my absolute FAVORITE products that are suitable for all hair types. HEATED.DEFENSE is a weightless, invisible leave-in foam that promises to protect your hair against heated tools and mechanical damage up to 232℃ / 450℉. It reduces damage while conditioning and smoothing, strengthens hair by creating a protective barrier with essential moisturizing agents. Can be used wet or dry. STAYING.ALIVE is a high-performance leave-in, oil-free treatment, that instantly helps repair damaged or color-treated hair. Enriched with silk proteins to help smooth and repair damage, packed with antioxidants, this weightless mist of goodness promotes elasticity in the hair and helps overcome dryness, while teasing its way through tangles with ease. Helps to seal the cuticle, fight frizz and deliver smoothness. Adds nourishment and strength, suitable for all hair types. This product is a MUST for all color clients! Infused with Immortelle to help counteract oxidation and therefore the aging process, this intensely nurturing treatment oil delivers deep conditioning benefits that leave hair feeling soft and smooth with an overall boost to shine. Use daily to fight the fight against hair aging and to provide protection against environmental stressors, and heat damage. Weightless, nutrient-rich oil, antioxidant-rich blend helps to restore and replenish the hair, helps promote elasticity and increase shine. Adds moisture to dry, damaged hair, deeply nourishing and conditioning. Ideal for dry, damaged and aging hair. BEDROOM.HAIR puts touchable texture, separation and movement into the hair, while still allowing you to run your fingers through from roots to tips. This is one of my all time favorite products! Make every moment a bombshell moment, and banish brassy tones with BLONDE.ANGEL WASH. Lavender-infused, color enhancing shampoo takes on all tones – from creamy to platinum, and with the help of added optical brighteners rescues dull color – taking it from drab back to fab. Helps restore shine and brightness and maintain ‘cooler’ tones. Gentle enough to use every wash.
Repair, renew and restore dry, damaged, frizzy over-processed hair with REPAIR.ME.RINSE, this deeply nourishing and strengthening conditioner helps reconstruct and repair the hair. Packed with a powerhouse of ‘soft-state proteins’ and enzymes to deliver gentle lubrication to the hair, while helping to restore and protect against future damage. My hair has NEVER felt better after using this only 1 time! I highly recommend this to all of my blondes and anyone who has damaged hair. Now that you have your fresh new hair, here are some Aftercare Instructions! Do not wash your hair for at least 48 hours. If your hair has been lightened it can take up to 2 weeks for the cuticle to close. That makes it easier to lose color pigments during that time. Use Salon Grade Products, I can only guarantee my color services if the suggested products are purchased. It really is worth the investment! When you use salon grade products you don’t have to use as much, your hair will be in better condition, and your color lasts longer.